Provide community members the chance to contribute their time and talents. In its first year, the farm produced 5,500 pounds of beautiful homegrown produce! However, obstacles kept them from fulfilling their other goals. Transportation and time barriers kept clients from learning gardening skills or contributing their talents at the FARM. So in collaboration with the UMN Extension SNAP-Ed program, BCFS reached out to MSHS and applied to be a part of the Garden-in-a-Box program. What has sprouted since is remarkable! In 2015 ten boxes from GIAB doubled ten boxes built by BCFS going to low-income housing complexes. 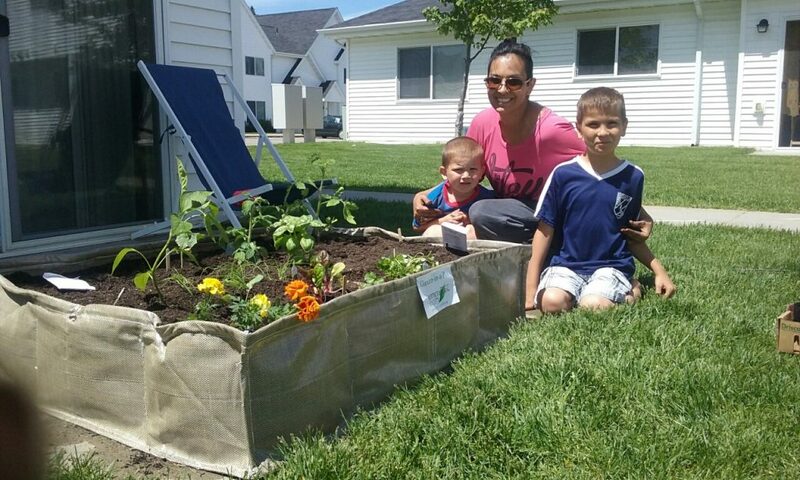 This enabled 20 families using the Food Shelf to garden in their own backyards! The boxes were so popular that in 2016 BCFS purchased ten more from MSHS to expand the program. This past growing season 25 boxes gave 81 people (54 of them youth) opportunity to grow their own food. “She loves to plant and also loves to eat fresh veggies right out of the garden,” professed Lin James, the program’s garden coordinator about one enthusiastic participant. “Kids love Planting Day!” The program uses the veggies in cooking classes taught by UMN Extensions Snap-Ed Educator, Deb Dilley, to demonstrate healthy eating and self-sufficiency. All involved look forward to 2017! In the small town of Arlington, the University of Minnesota Extension and MSHS’s Garden-in-a-Box Program developed a small but sustainable way to connect and support the town’s Latino community through gardening.